Over a year and a half ago I started Confident Twosday to celebrate women feeling confident about themselves. I wanted a place where bloggers could share a post they feel good about or an outfit they felt especially good in. A few months ago, I wanted start sharing what was making me feel confident each week. I want to be clear though, confidence is something I think you need to find and nurture within yourself. It isn't something you can completely draw from an accessory or article of clothing. We are all different and it's something that makes us special. Personally, I know I have struggled at times throughout my life with my self-confidence. There were always people better than me, smarter than me, faster than me, or prettier than me. It took me a long time to realize THAT IS OKAY! We cannot dwell on things that bring us down. Focus on what lifts you up. Sure there are lots of runners that are faster than me or in better shape, but I know my own determination to get better and back to the place where I was a few years ago when running and that makes me feel good about myself. I focus on my running accomplishments, too. There is always the choice to focus on the positive in lieu the negative when thinking about ourselves. And doing that helps build your confidence. I like to pick a few things about myself I am proud of. I encourage you to do the same. Whenever you start feeling down about yourself, stop it! Focus on those traits or characteristics that make you feel good. Build that confidence, baby! Also some great news for those of you wanting an item from SheIn! Today through tomorrow 4/21 at 5am, SheIn is providing free worldwide shipping with no minimum! There are clearance items at up to 85% off so you can get some great items for a steal! Today Deena from Shoes to Shiraz is co-hosting. I have only been following Deena's blog for a bit, but I love her writing style. She's witty and fun and her blog is full of stories, cute outfits, and food! She is also a contributor of The Blended Blog. Deena is from Canada so last month I felt kinship with her when everyone else was starting to wear their cute spring clothing and we both had snow! Make sure you go visit her blog and say hello! Also it's her birthday today so wish her a Happy Birthday as well! Glad to join you for the first time Laura. Congrats on hosting this link up for 2 year now. The neon & houndstooth is super cute together!! I think I've been linking up to this party since almost the beginning! Confidence is a hard thing for me, I have a lot in some areas and not a lot in others... Good luck with your running! That neon top looks great with the b/w of the houndstooth skirt! That is my favorite summer color! We all should focus on the positives and the little things more often. That's what makes us special! Love the neon and houndstooth combo! Confidence is the best accessory! Whenever people tell me I come across as confident, I'm always surprised. Any bit of it was earned and learned ... I was a very insecure little girl. You look gorgeous, glowing, and very confident in your bright top and fab pencil skirt! Thanks for the pep talk today about confidence. I needed that. Love your chic look! That bold colored top is perfect with this houndstooth skirt. Love the pop of color with this outfit!! Looking fab! the punch of colour from your top is perfect to balance the houndstooth skirt. I keep gratitude journal and with my Self Care coaching clients are struggling with confidence I recommend they start a gratitude journal and each day write 2-3 positive things (some days may have more) that happened in their day - something that made them smile, a experience they enjoyed, someone who made their day easier. In times of feeling low re-reading these is a great reminder how fabulous their life is - how much they have accomplished and that they have strength to be their best self. Happy Tuesday, Thank you for hosting. This is such a great thing to remember Laura, and I can definitely relate to the running aspect. It's hard when you get passed while running. I feel so slow when that happens, and I have to remember that I haven't been doing this for long and that I am doing the best that I can. I really love this color combination that you have going and that houndstooth skirt is such a great piece. Thanks for hosting the link up! Yes, confidence is so important! Great outfit! I love the houndstooth skirt with the neon top! 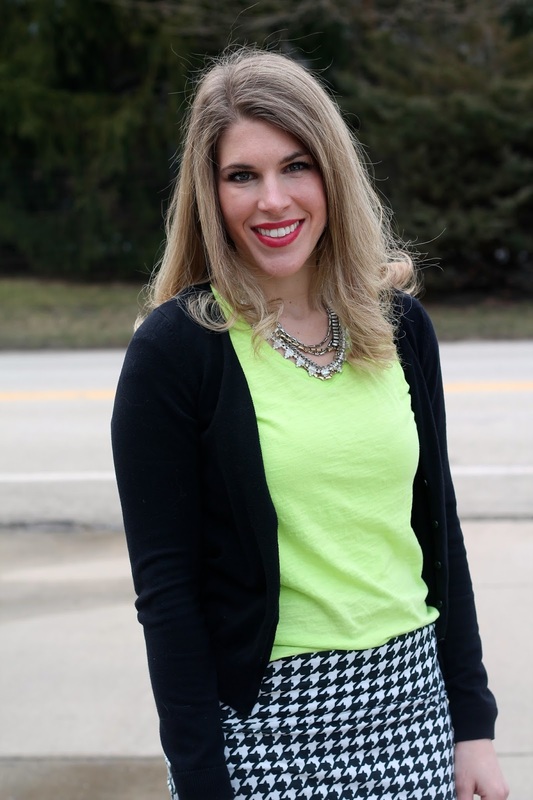 The neon shirt is the perfect transition piece & the houndstooth skirt is my fave! Come check out my latest collab with Express and let me know what you think - Happy Tuesday! Love that skirt.. houndstooth is just such a great timeless print isn't it!! The bag is divine too! Houndstooth is one of my top five favorite prints ever! I love the neon top paired with it and I believe I could re-create this from my closet. I appreciate the pep talk girl! I have definitely fallen into the comparison trap before and have to remind myself that I am just as good as anyone else! Thanks for the reminder and for hosting the link up as well. Love that color shirt with the houndstooth skirt. I'm always afraid to be bold like that and tend to stick with a solid black or white item. Love it on you! Love the bright top paired with the houndstooth. Your bag is a stunner! Happy Tuesday girl! I love how you paired the neon top with the houndstooth skirt. So unexpected, but it works so well! It's a great message you're relating! I think it helps to be around other people that build you up and are positive also. Friends can make such a difference in our lives!! Amen on the confidence thing. I have such a different version of myself in my head than what my husband..kids...friends see. I need to hone into their voices more when I'm faltering. Thanks so much for including me and congrats on the 2 years of this link up! I have loved getting to know you and look forward to more beautiful, confidant you and also no snow for a loooong time. you can't go wrong with a houndstooth anything, really! this skirt is my favorite way to wear it! love the pop of neon--so fun! I love the neon paired with houndstooth. Wise words! So hard not to look left or right, but so worth it. Love this look! Love the look, the pop of neon is perfect for Spring! I love the neon paired with black & white! Love the vibrant color with the black & white! 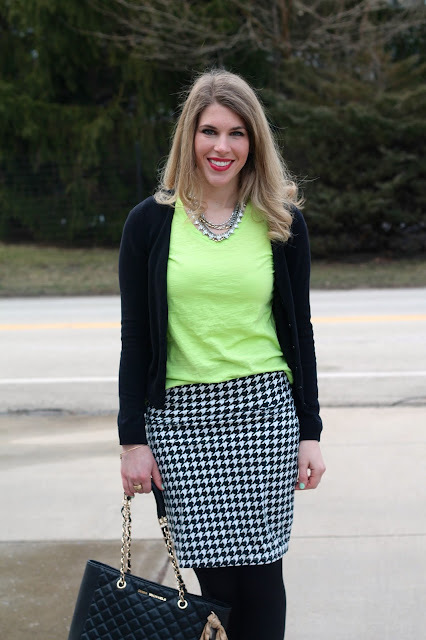 I'm loving the neon paired with the houndstooth skirt! It really brightens up the look! I agree that everyone woman should feel confident with herself. It's something I work on daily, but not always the easiest thing to accomplish! You are quite right - it is all too easy to go to a negative place and bring ourselves down, and so much harder to focus on the positive. It is an active mindset, but when we are able to shut out the voices that tell us we will never be good enough, we can be so much greater. I love the neon tee with the houndstooth skirt; it is so unexpected. I love being able to come here and be encouraged by other fashion bloggers. Confidence does come from within and it is refreshing to see all shapes, sizes, and ages looking beautiful. Love the bright color with this look. I agree that one can be helped by dressing nicely with their confidence, but it does have to come from within. 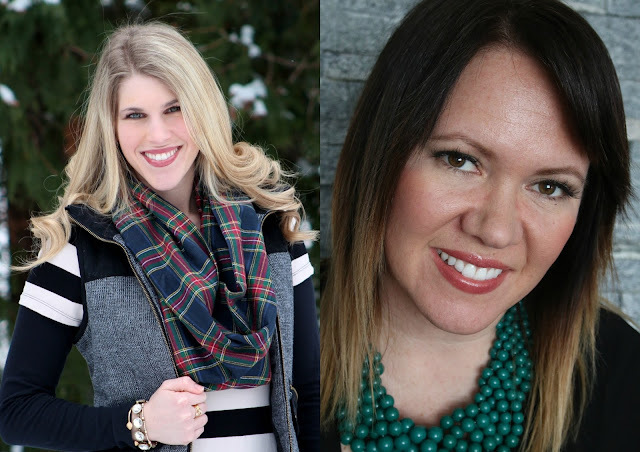 I enjoy the linkup and find inspiration among other women. Wonderful post! I couldn't agree more. I am having one of those kind of days today. Great link up! And you look marvelous!!! So well said! Why do we allow ourselves to get bummed out?!? It is so hard sometimes to not dwell on the negative things about ourselves, but you are right, it is a must. You are beautiful, and super stylish, and although I have never seen you run, you are for sure faster than I am!! Love this post. I also love this look, loving the pop of neon! I love the pretty neon and that skirt! So cute! Great message all around. Your neon shirt looks so fab with your houndstooth skirt! Loving those booties. Love that color! I ordered something similar yesterday and can't wait to see if it will work on me. Totally agree with your message...cannot have confidence and comparison it just will not work. Have a great week! I love this new direction you're taking by sharing what makes you feel confident! I'll have to remember to start adding that in a few of my posts! Such great advice - and I'm still working on it. Posting outfits on the internet does help with confidence though! Love this look on you - so pretty with the neon. You and Deena are a perfect collaboration pair! I absolutely love the contrast between the neon top and houndstooth skirt. Beautiful! Holy glamorous!!! You look absolutely flawless. I love how you styled the skirt with the neon top...everything looks amazing!! Love the houndstooth! Such a classic pattern! A pop of color is great for black and white looks. I love your skirt! Focusing on the positive is so important and such a boost. Great message. This is such a fun look! I have a similar neon tee so this is great inspiration for a new way to style it. I love what you said in this post too. I feel like we can be so hard on ourselves, so this is a great reminder to focus on the positives.